Wolverhampton in the 1890s was a bustling industrial town. Leading industrialists and inventors come to visit Baldwin Bantock, one of the town’s worthies. His visitors include Charles Mander of the local Wolverhampton firm, Henry Loveridge, the japanner, and Thomas Parker, inventor. They all claim to have come to see Baldwin’s newly-built Billiard Room. But is that the real reason for their visit? And why doesn’t Baldwin ever use his wonderful new play-thing, now he’s got it? As the drama unfolds, the audience eavesdrop on the things that Victorian captains of industry found important, worrying, amusing and scandalous. The play gives a feeling of what it was like to live in a world which was every bit as dynamic as today. Where change, and the need to adapt to it, was vital for men of business (and their workers) to keep ahead of the game. Electric cars were being built in Wolverhampton, the cinema was being born in France and the modern Tube was being developed by engineers of genius like Thomas Parker. Wolverhampton was in desperate rivalry with Coventry to develop the new cycle and motor car industries which were about to burst on the world. 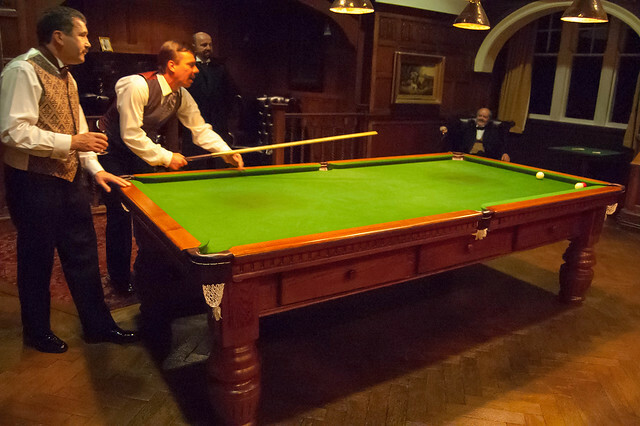 The play was performed in Wolverhampton’s Bantock House Museum, once the home of Baldwin Bantock, on the 1st, 2nd and 3rd of November 2007, to coincide with the opening of the newly refurbished Billiard Room, where some of the action in the play was set. These performances were supported by Arts Council funding. BBC Listing for this play.